Shiraz Gardezi, cameraman of Geo News television channel was assaulted by the supporters of Pakistan People’s Party (PPP) political party on March 20, 2019 outside the National Accountability Bureau (NAB) court in Islamabad, the federal capital of Pakistan. Gardezi, who is also a joint secretary of the National Press Club (NPC), Islamabad, was covering the protest staged by PPP supporters outside the NAB court during the graft case hearing of PPP chairperson Bilawal Bhutto Zardari and his father Asif Ali Zardari who is also the co-chairperson of the party. When the PPP leaders reached the NAB court, some supporters managed to cross the police barricade to enter the main gate with Zardari’s car. 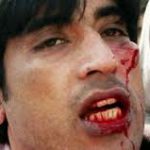 When the police officers tried to forcibly remove them, a clash ensued during which Gardezi was beaten and injured by the PPP supporters. Speaking to the Pakistan Press Foundation (PPF), Gardezi said, while he was taking shots of NAB building, he was suddenly slapped on his face by a party worker and then a group of workers started beating him. The Pakistan Federal Union of Journalists and Rawalpindi Islamabad Union of Journalists (RIUJ) has condemned the attack on Gardezi. Talking to PPF, PFUJ President G.M. Jamali said that constant attempts were made to gag the Pakistani media in different ways, but PFUJ has never backed down in the face of pressure and threats. Shakeel Qarar, President of NPC Islamabad also condemned the attack on cameraman and urged the party leaders to control their supporters and stop attacking journalists working in the line of duty.